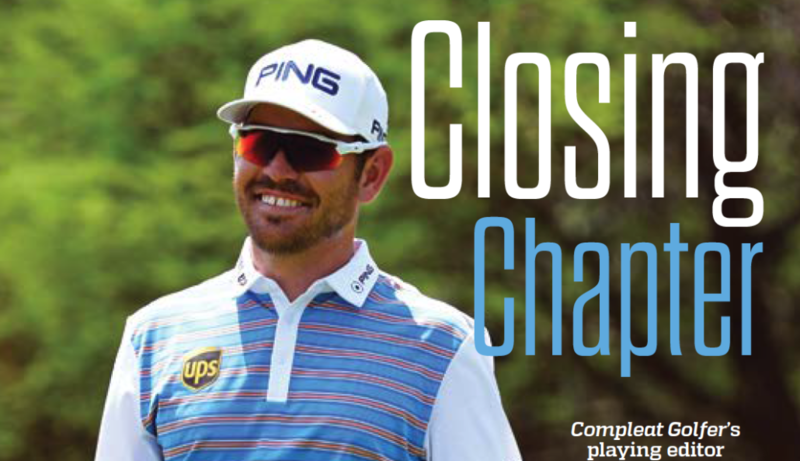 After three years as playing editor, it is time to bid you farewell, writes Compleat Golfer playing editor Louis Oosthuizen in his final column. It’s certainly been plenty of fun getting to share some of my playing tips with you and giving you a closer look at my personal life and what it’s like being a professional golfer and family man, and playing around the world while juggling business interests. I have every confidence the team has made the right call on the player who will be following in my FootJoys. To the team at Compleat, especially Gary and Wade, thank you for the opportunity to work alongside you and play a part in moving South Africa’s best-read golf magazine forward. The Nedbank Golf Challenge is a demanding week, but I loved every yell from the crowd and the applause from start to finish. You just can’t beat playing on home soil. The award in 2016 – South Africa’s top-performing magazine – was a highlight and I look forward to more chats about my career, hopefully another Major win or two, and all the positive results coming out of my Louis57 Foundation. The good thing is, I will certainly not be disappearing from the magazine as we have teamed up to give away some seriously big prizes. Some of them are so good, I wish they would allow me to enter! But that’s not the case. It will just mean more chances for you, though! Moving back to the course, I’ve just digested my week at Sun City. The Nedbank Golf Challenge certainly was a rollercoaster ride and I showed some of my best: my ability to grind away. and then for a large part of the final round, my attacking play. After Saturday’s battle, things went really well on the final day, but what a round by Lee Westwood. Any time you go bogey-free with eight birdies – like Sergio Garcia did in round one – you have a massive chance of winning. I played well, made the odd mistake, and came up a fraction short. It was a lot of fun to be challenging with my friend Sergio and I took great pride in flying the South African flag throughout the week. The course showed its best side and the team did an excellent job preparing the championship layout in trying conditions. I shared my thoughts on the new 18th tee – like many of the field did – so we’ll have to see what happens there next year. Suffice to say, I’m not a fan of moving the tee box back. Sport brings out so many positive emotions and obviously there are letdowns, but to play well that week and challenge hard was a real boost to my confidence. It’s a demanding week, for sure, but I loved every yell from the crowd and the applause from start to finish. You just can’t beat playing on home soil, and walking off the course straight to family and friends is certainly something I wish I could do more often. The good thing is that December brings two massive chances to get back into the winner’s circle, starting with the SA Open at Randpark. The quick turnaround to the Alfred Dunhill Championship at Leopard Creek is very exciting. It’s a special course and I’ll be leaving nothing in the tank in search of victory. Some players will love the continuity and others will be hoping to find their best form if they struggle at Randpark. I hope the fans turn out with so many big names in the field. I won’t be too concerned about the others when I tee off, because it’s an event I’m desperate to win. It would be a massive achievement, a lifelong goal, if I could put my name on the trophy. I’m signing off for now but I will be working hard to get my face back on this magazine’s cover.